Buy Green City Ground Cinnamon - 26g in the UK from our online shop or directly from our independent Scottish store. You can use ground cinnamon both in sweet or savoury cooking. Tasty way to use your (homemade) sauerkraut. Sauerkraut has lots of health benefits, besides that it's also virtually fat free. This recipe contains 1 tsp ground cinnamon. This lentil dish is vegan, seasonal and gluten free. Because you are only using onions and chives as 'vegetables', you can eat this seasonally from March right until the end of October. This recipe contains 1 tsp ground cinnamon. Plums are in season in September and this pudding is a great way of using them (other than eating!). Have this pudding for dessert on its own with a cup of tea. This recipe contains 1 tsp ground cinnamon. Cooking gluten free doesn't need to be more difficult as this gluten free recipe for apple pie shows. This recipe contains 1 tsp ground cinnamon. Make this warming gluten free porridge with dairy free almond milk. Cinnamon is great to start the day with. Try not to use table sugar as it will make the blood sugar spike, use low GI substitutes. This recipe contains 1/2 tsp cinnamon. A healthy porridge made with millet grain, raspberries and dates. Use frozen (mixed) fruit for a year round breakfast. This recipe contains 1/4 tsp ground cinnamon. Oliebollen are normally made with milk, egg and wheat flour, but this recipe uses milk alternatives and no egg. So suitable for vegans. This recipe contains 1tsp ground cinnamon. Speculaas is a traditional Dutch biscuit eaten at 'Sinterklaas' the 5th December. It has its own special spice mix which you can easily make at home. The spices are also available in bigger quantities saving you money! This recipe contains 30g ground cinnamon. This breakfast is bursting with health benefits: -	Oats contain ‘oats beta-glucans’ which can support a healthy cholesterol -	Blueberries contain high levels of phenol antioxidants and anthocyanin antioxidants. These (and other) antioxidants are good for brain health and immune system. -	Honey has lower GI than sugar This recipe contains Pinch of cinnamon. Where can you buy real Cinnamon Ground - 26g safely online? 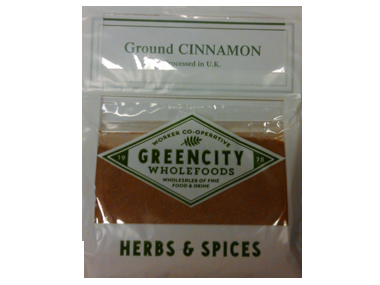 If you are wondering where you can buy Green City Ground Cinnamon - 26g safely online in the UK, then shop with us. Cinnamon Ground - 26g - Green City Ground Cinnamon - 26g in Herbs & Spices and Herbs, Spices & Salt.